Although considered to be apex predators, tigers are known to be preyed upon by dholes. 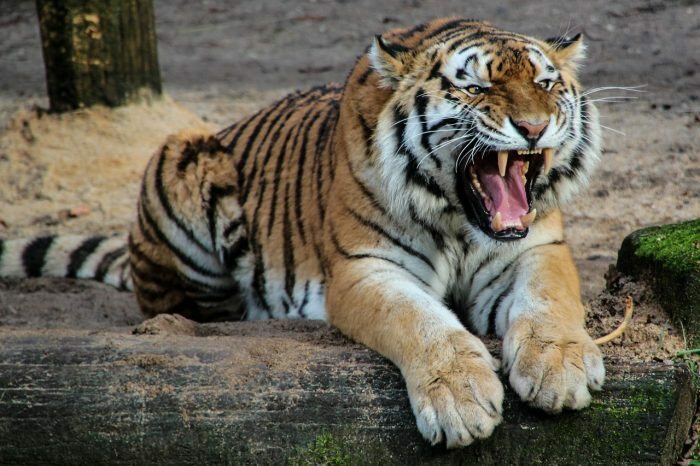 Humans may also hunt tigers for the meat they provide, which is an expensive delicacy in some cultures. Indiscriminate poaching and habitat loss due to human intervention contribute to the rapid decline of tiger populations. Tigers are at the top of the food chain, and these animals generally do not have natural predators in the wild. However, tiger cubs may fall victim to adult tigers. Chance encounters with dholes, which are an undomesticated species of dogs found in Asia, may also result in tigers getting killed. Tigers usually die from being overpowered by the sheer number of dholes in a pack but not before inflicting severe damage and significant losses to their attackers.